A friend sent this. It couldn't be more true! I once started reading a book on the Manhattan project during WW2. It was so good that I finally stopped at 5 AM just as the sun started to come up. The only reason I stopped was I could no longer focus on the print. The other was expedition by Jerry D Young. That was a PDF and it was so long and good that I spent almost 1 week on it. This is from a person that would read a normal paper back in 3 hours or so. I would highly recommend Jerry's books as they are always very good and have all sorts of lessons for TEOTWAWKI fiction. He has them on Amazon, most are 99 cents each. Expedition is $10 and worth every penny! 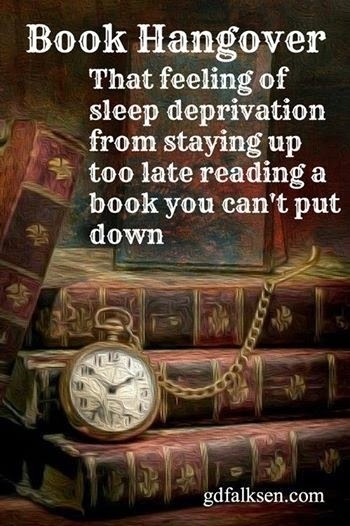 I can think of two book hangovers I've had lately. One was for Pournelle and Niven's "Lucifer's Hammer" and the other was for Dan Brown's "Inferno." Wow. 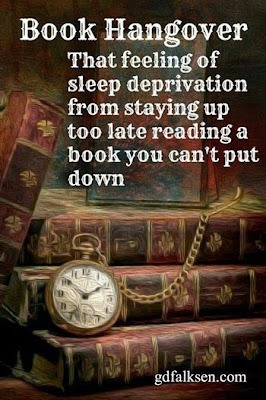 I had such a great time with each of those books. Wish I'd known the name - would have been so much easier to explain.